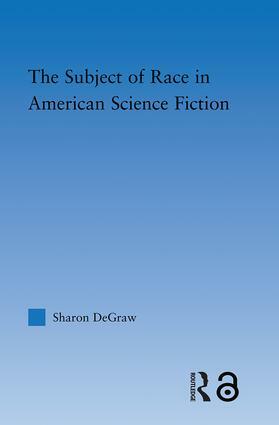 While the connections between science fiction and race have largely been neglected by scholars, racial identity is a key element of the subjectivity constructed in American SF. In his Mars series, Edgar Rice Burroughs primarily supported essentialist constructions of racial identity, but also included a few elements of racial egalitarianism. Writing in the 1930s, George S. Schuyler revised Burroughs' normative SF triangle of white author, white audience, and white protagonist and promoted an individualistic, highly variable concept of race instead. While both Burroughs and Schuyler wrote SF focusing on racial identity, the largely separate genres of science fiction and African American literature prevented the similarities between the two authors from being adequately acknowledged and explored. Beginning in the 1960s, Samuel R. Delany more fully joined SF and African American literature. Delany expands on Schuyler's racial constructionist approach to identity, including gender and sexuality in addition to race. Critically intertwining the genres of SF and African American literature allows a critique of the racism in the science fiction and a more accurate and positive portrayal of the scientific connections in the African American literature. Connecting the popular fiction of Burroughs, the controversial career of Schuyler, and the postmodern texts of Delany illuminates a gradual change from a stable, essentialist construction of racial identity at the turn of the century to the variable, social construction of poststructuralist subjectivity today.